Economics is all about learning from previous market movements, and trying to predict the next big move. Let’s look at historic bubbles to see what’s next. 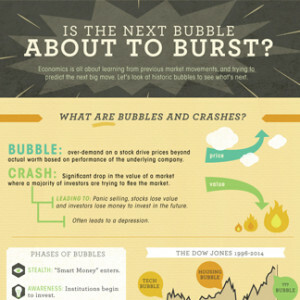 What are bubbles and crashes? Bubble: over-demand on a stock drive prices beyond actual worth based on performance of the underlying company. Crash: Significant drop in the value of a market where a majority of investors are trying to flee the market. –> Leading to: Panic selling, stocks lose value and investors lose money to invest in the future. –> Often leads to a depression. 1.) Stealth phase – “smart money” enters. 2.) Awareness phase – Institutions begin to invest. 3.) Mania Phase–Media broadcasts to general public who invest. Speculation rises, prices soar. Peak: Tulip worth an estate. Bottom: Tulip worth an onion. Scarcity and demand increase again. Tulip price increased x20 in one month. (2) Others waited longer, trying to continue flipping tulips until there was no demand. To halt panic government offered 10% of contracts. (2) Those who didn’t lost houses, life savings. Lesson: Don’t heavily speculate on objects without intrinsic value. 18th century saw a large section of Britain with money to invest. Britain controlled the world’s seas. Hard to invest in other companies. Mistakenly believed Mexicans and South Americans were waiting for someone to introduce European fineries. South Sea Company uses 10million pound IOW to the government to purchase “rights” to all trade in the South Seas. South Sea Company issues and repeatedly reissues stocks. South Sea Company was mismanaged. Entire shipments were routed to the wrong ports and left to decay. Fueled by nationalist pride, British continued to invest to compete with French Mississippi Company. Lesson: Don’t let government favoritism and nationalism obscure faulty ventures. Peak: Mississippi Company stock worth 80x the value of all gold and silver in France. Bottom: The entirety of France thrown into a depression. France, insolvent after a war, issues paper money. Company of the West obtains rights to Mississippi Valley in North America. Using paper money Company of the West monopolizes French tobacco and African slave trades. Issues a total of 625,000 shares. Shares increase from 500-18,000 lira with the glut of paper money. John Law, founder of Company of the Indies (as it was renamed), begins to control France’s foreign trade and finances. State issued public securities backed by company of the Indies stock. Peak: 272 Acts of Parliament passed and 9,500 miles of new railway approved in one year. Bottom: Massive number of middle income families bankrupted. Low interest rates pushed investment. Small number of early railroads were very effective. [South Sea] Bubble Act, limiting investment to 5 people, removed. At peak, 1/3 railroads collapsed due to financial planning, or because they were shell corporations used to commit fraud. Lesson: Disruptive technology drives growth, within bounds. Peak: 1926 luxury condos going for $4.5 million, unadjusted for inflation. Bottom: Real estate prices ended up lower than before. Scarcity of properties increases demand. In order to claim a profit, prices had to continue to rise. Panic when buying stopped leads to mass panic. Lesson: Products with inherent value (houses) don’t crash as hard an products without inherent value (tulips). Peak: Massive new leisure class from the invention of the radio, automobile, and commercial airplanes. Bottom: Thousands of banks fail and unemployment skyrockets. Booming markets through the 20’s were at massive highs. Margin buying allowed investors to pay just 10% of total value of stocks then pay installments. Huge influx of start-up banks with few regulations. Brokers were regularly lending investors 2/3 the price of stocks. Banks used customer deposits for risky speculations. Market loses 11% of value at opening bell. Leading bankers meet to stop slide, buying large blocks or shares above current market. Market stops sliding but scares investors. Next day the Dow drops 12%, with the largest volume of stocks traded as any day in 40 years. By July, the market lowest of the 20th century, losing 85% of value. Lesson: Investment and commercial banking should be separated. Peak: Dow stock index nearly doubled from 1986-1987. Bottom: Dow lost 22.6% of it’s value and had the largest one day market crash in history. Uncertainty from the cold war, a new Federal Reserve chairman, and a falling dollar. After a massive slide, the economy continued to grow, and the market rebounded. If you invested $10,000 the day after the crash, it would be worth $133,000 today. But if you invested the Friday before the crash, it would still be worth $98,000. Rule: Investment should proceed based on principles, not predictions. Lesson: You can’t replace lack of inherent value with insurance. Even when we learn from booms and busts, we tend to forget our lessons over time. Is this the next big bubble?